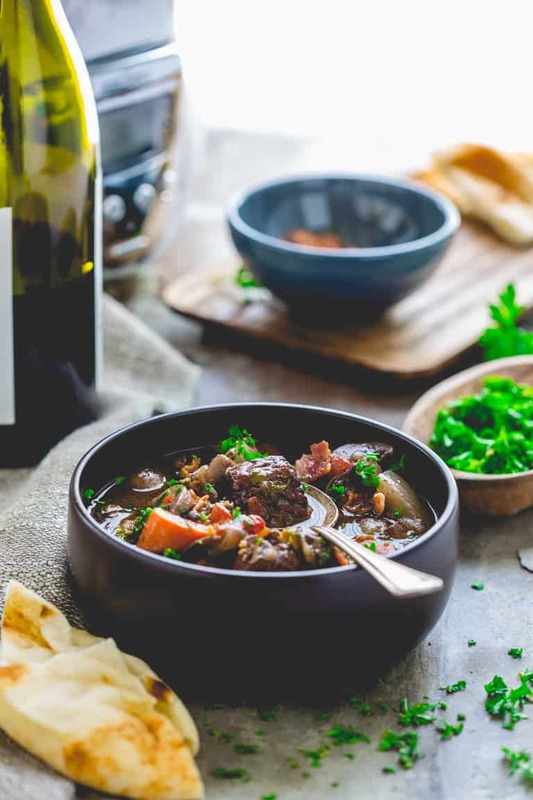 Here is a slow cooker variation of the classic French recipe for Beef Burgundy. It is slowly braised beef, mushrooms and carrots in rich red wine sauce. I added a little bit of bacon and maple syrup to this recipe to make it even better! It is the perfect recipe to bring in the cooler weather! Last weekend when I was in Austin, I was reminded of the fact that while I live in Vermont, and we are in the middle of fall foliage, the rest of the country is still having some warmer weather. Here in Vermont however, fall is assuredly here. 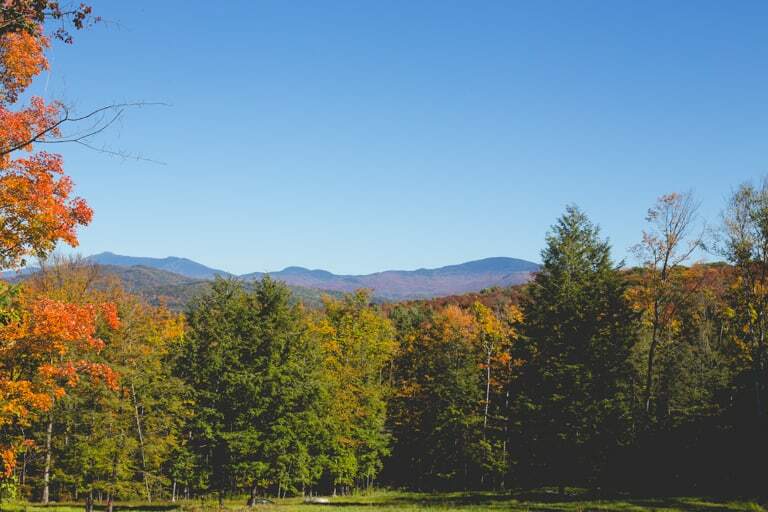 Yesterday I woke up to a view from my kitchen window of Mount Mansfield, the highest peak in the state, with a dusting of snow above the tree line. Last night we had a frost warning, so I stole a moment before it got dark to get out into the garden to cut all of the remaining basil. We brought in a large bundle of rosy hydrangea blooms so they wouldn’t turn brown. Jase lit a fire. We’ve got our fluffy winter comforters on the beds now. It’s sweater weather. And not to brag, but the Vermont foliage this year is unparalleled! Just magnificent, and it seems like very little of the leaves have dropped yet. We’re there. It’s fall. It’s the cooler half of the year. So, like it or not, it’s time for the slow cooker to get it’s work out. Time to bust out the red wine and the braising cuts of meat. The stewing vegetables. 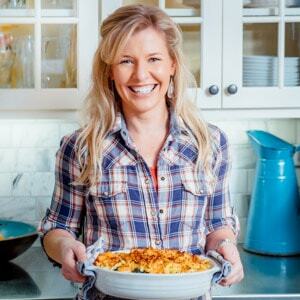 The comfort food recipes! Beef Burgundy is about as perfect as it can get for this type of weather. 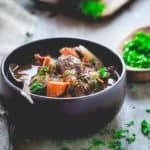 I made this slow cooker beef burgundy recipe over and over again to get it just right. I wanted to make sure you all would love it! There were two things I did which I think made a big difference in why this is so yummy and I want to tell you why I did them. One, I added a touch of maple syrup. I did this because I felt that the earlier tests of the recipe were too sharp and acidic from the wine. The sweet caramel flavors from the maple balance it out. The second thing I did was I thickened the sauce with beurre manie, which is a mixture of softened room temperature butter and flour that is whisked into a sauce or stew to thicken it as it simmers. I had tried to use corn starch in previous tests, but I felt that the sauce was too wan. 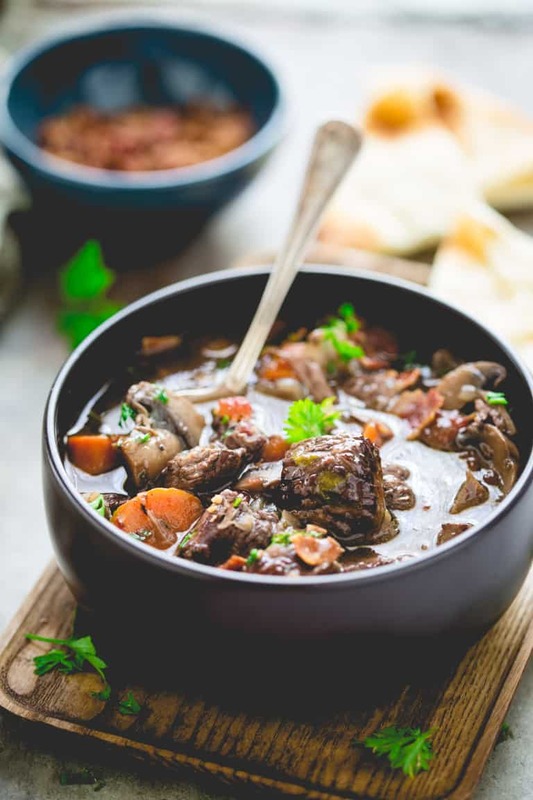 The butter and flour mixture really gives the red wine sauce a velvety mouth feel of a true Beef Bourguignon. I only needed two tablespoons of butter to do the trick, but it makes all the difference. What was really surprising to me was the bonus of what happened to the maple flavor when I made the switch from cornstarch to butter and flour. The butter really brought out the maple flavor, and the maple brought out the butter flavor. This has to do with the fact that butter and maple are BFFs (In case you missed it, I was talking about these BFFs a couple weeks ago when I made maple apple crisp. See tip #4). The same phenomenon is true in savory dishes. 1. Sear the beef chuck — Heat a little oil in a heavy-bottomed skillet over high heat, then add the beef and cook until seared and browned on several sides and no longer pink on the outside. Once seared, transfer the beef to the insert of your slow cooker. 2. Sauté the vegetables — Using the same skillet you seared the beef in, sauté the onion, mushrooms and thyme in a drizzle of oil. Cook until the vegetables start to soften and brown, making sure to stir the veggies often. 3. 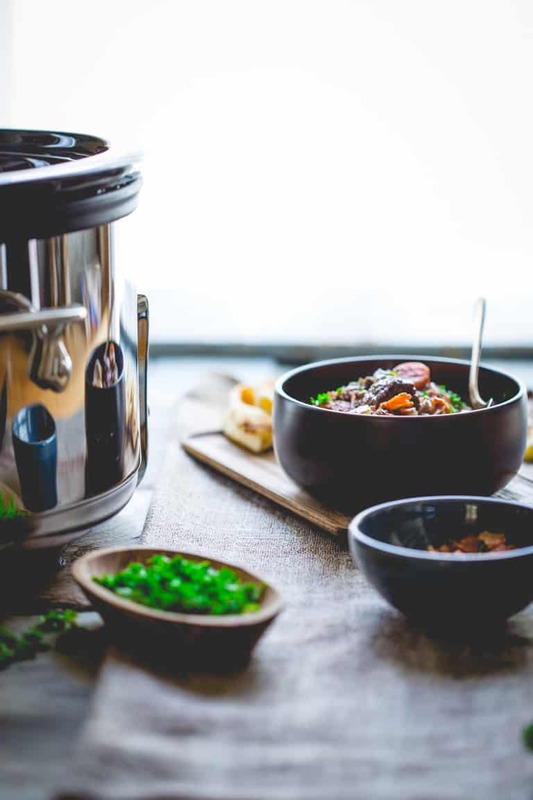 Combine all the ingredients and cook — Transfer the vegetable mixture to the slow cooker, then add the wine, carrots, celery, tomato, broth, maple syrup, salt and pepper. Give it all a good stir before covering and cooking on low. 4. Stir in the beurre manie — In the last hour of cooking, mash the flour and butter together in a small dish until smooth. Stir the mixture into the stew until it dissolves, then cover and continue cooking until the timer goes off. 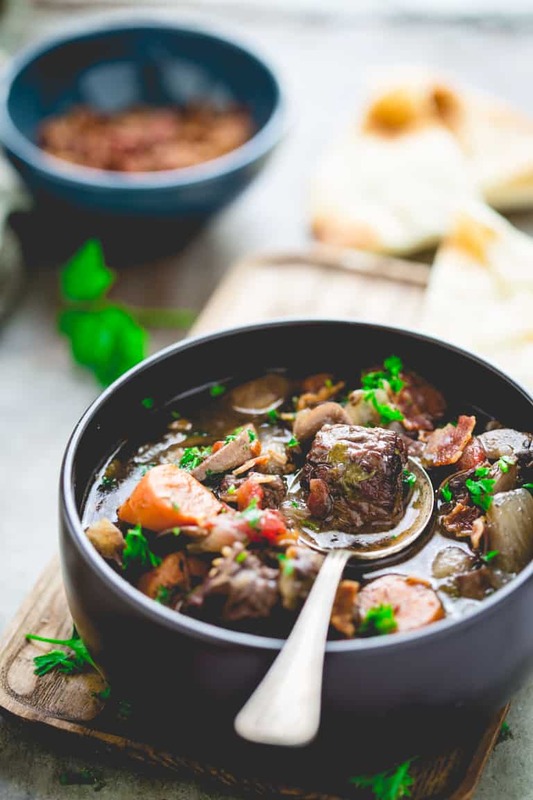 Stir the bacon into the stew at the very and serve the slow cooker beef burgundy with a sprinkle of chopped fresh parsley. Friends, please come back and let me know if you try this dish! I love hear from you! Leave me a comment, or shout out on social media! 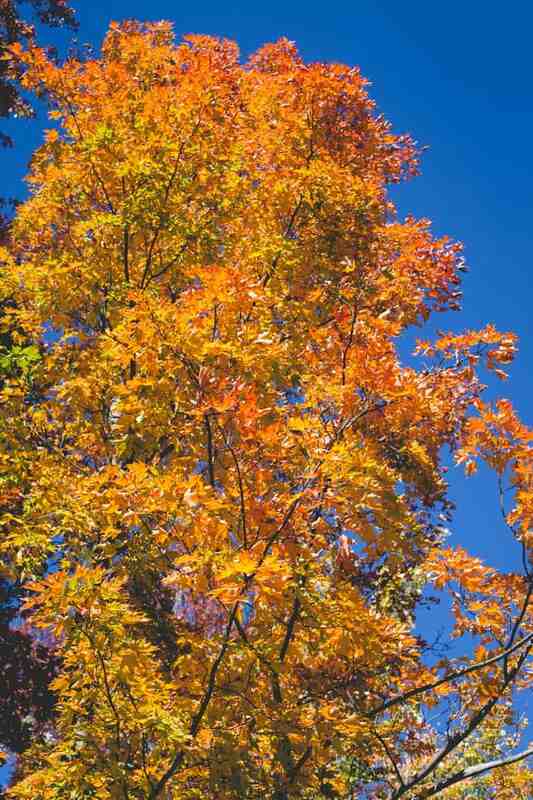 Has the foliage been changing in your area? What is the fall weather like there? Have you had a frost? 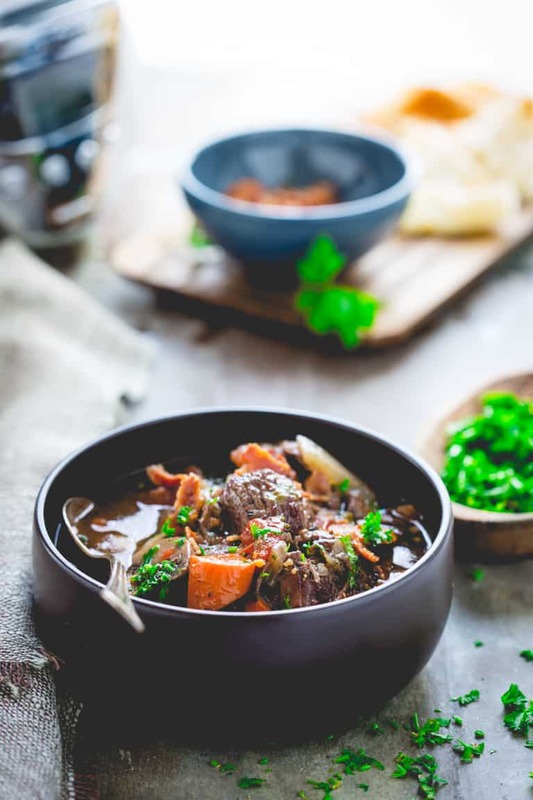 Have you made Beef Burgundy or beurre manie before? Definitely trying this one! Any suggestions for a substitution for the mushrooms? Also, love the bowls..please share where you purchased. Thanks! So glad to hear it Pam. I’d try just skipping the mushrooms all together. the onions will cook really quickly without the moisture of the mushrooms. So the err on the side of under cooking the onion. You could also increase the carrot, celery and tomato a tad to bulk it up a bit. If you do try it, please come back and let us know what you tried. I am sure there are other readers wondering the same thing. I love the cooler nights for sleeping weather too! That’s a common problem, and the first time I tested it I thought the beef was tough too. In the first test I simmered the wine and broth in the skillet. I changed the method so that the wine and beef go into the slow cooker at room temp. That means the beef cooked more slowly, and the subsequent tests resulted in much more tender beef. Love you variation on this classic dish! Perfect fall dinner! This really looks good, but I wondered if you happened to have a nutritional breakdown on it. I just analyzed it and added the nutritional stats into the recipe for you Elaine. Hope you enjoy the recipe! I made this tonight – it was delicious! The beef was PERFECT. Not tough or too chewy at all. This will definitely be a repeat in my house! I am so happy to hear that Alyssa! Thank you for coming back to let us know that you liked it. I really appreciate it. 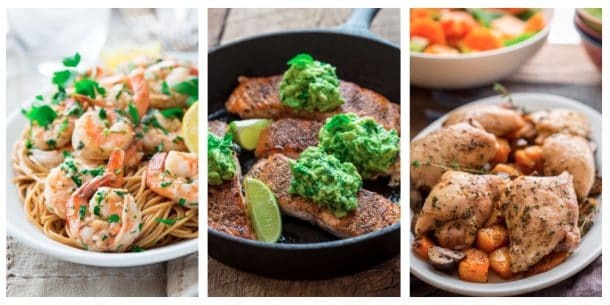 Fantastic autumn recipe, a dish to warm you up on a cold rainy day..
Oh these look amazing! …will try these for sure!Thanks for the recipe. Looks delicious! If I were to freeze this after doing step 4, adding the butter and flour, would it thaw okay? Yes, once the stew is done you can freeze and thaw it. The flour will still keep its thickening power even after a thermal cycle. I hope you enjoy it. Thanks for taking the time to compile it! Love the flavor of red wine in beef stew. 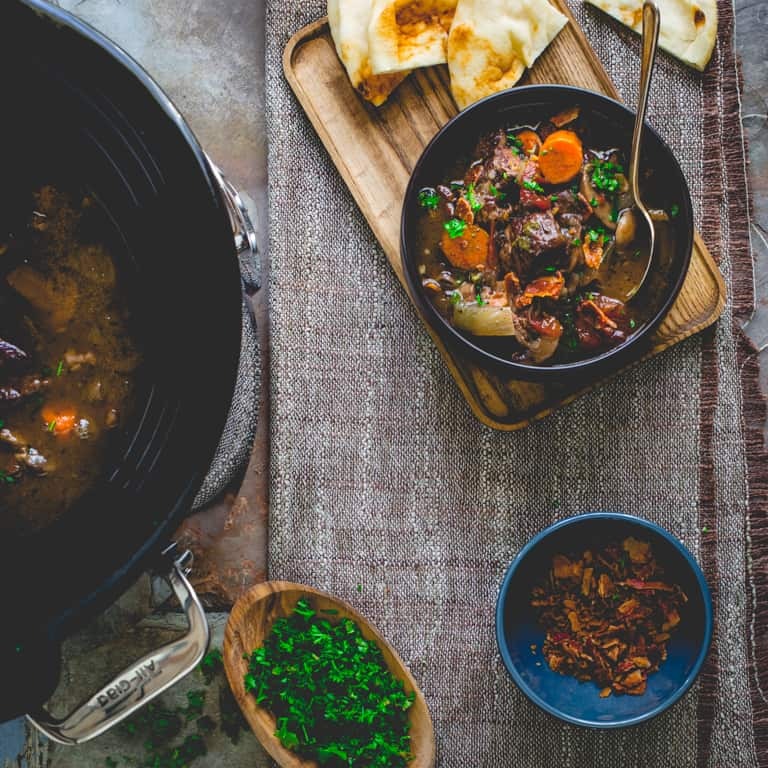 Great dish for those chilly days we surely have coming! Such a classic fall dish! Can I use sirloin tips? Yes you can, but note that the results will be dryer. That’s because sirloin is leaner and has less connective tissue than chuck.